DANYA NADAR (VOICE-OVER), TRNN: Inspired by the mass protests that brought down the Tunisian president Zine El Abidine Ben Ali on January 25, tens of thousands of Egyptians across the nation joined in protest of rising food prices, increasing joblessness, and calling for an end to 30 years of emergency law and President Hosni Mubarak’s rule. 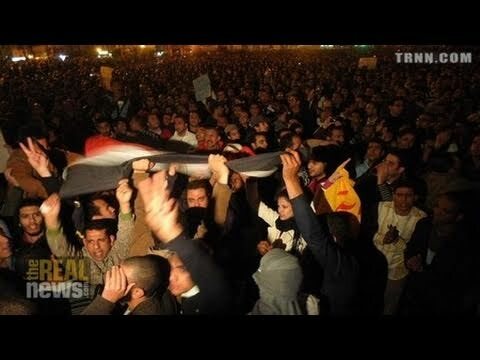 According to Al Jazeera, one police officer in Cairo and two civilians in the eastern city of Suez died amidst the rallies. On the same day of nationwide demonstrations, Secretary of State Hillary Clinton reiterated her confidence in the Mubarak regime by stating, quote, "Our assessment is that the Egyptian government is stable and is looking for ways to respond to the legitimate needs and interests of the Egyptian people." Since 1979, the United States has been providing Egypt with $1.3 billion in military aid, the second-largest after Israel. In a 2009 report by Ahmed El-Naggar from Al-Ahram Center for Political and Strategic Studies, a major Egyptian think tank, he says that this aid does not aim to strengthen Egyptian military power against any external threat, as this would be contrary to the declared US objective of ensuring Israeli security and maintaining Israeli military supremacy over its Arab neighbors, including Egypt. Instead, this aid is devoted mainly to strengthening the regime’s domestic security and its ability to confront popular movements. The demonstrations calling for Mubarak’s ouster continued throughout the day. The Real News Network spoke to Miret El Naggar, special correspondent for McClatchy Newspapers in Cairo. MIRET EL NAGGAR, MCCLATCHY NEWSPAPERS: These were the biggest demos Egypt has witnessed in decades. They were orchestrated by informal youth movements, as one called the April 6 Youth Movement, which urged Egyptians to join what they called a day of revolt. And they called on them on the social networking site Facebook to join this protest today. At first it started as a trickle, but then it really galvanized into thousands of people who marched down Cairo’s downtown streets and in at least five other cities across Egypt, from the northern port city Alexandria on the Mediterranean to the southern tip in Aswan. It’s hard to give a clear estimate of how many people attended. It was in the thousands, basically. Today’s revolt marked the Police Day, which is a national holiday. However, it was to remind the police that they should be protectors rather than harassers, as they have been, as the Egyptian public criticizes them of being for the past few years. Egyptians on the street today were demanding better wages, a dignified way of earning their bread and butter, and less torture by police. So the grievances are very similar to those shared by the Tunisian people, and in effect by people across the Arab world. Egyptians have been making these demands for some while. They seemed–the protests have lost a little steam in the past few years, but this Tunisian uprising, I think, gave them momentum again and reminded him of their grievances and made them actively ask for them again. The police tolerated the demos for a while, but then, towards the afternoon, they dispersed the protesters with tear gas, rubber bullets, water hoses. However, the protesters managed to regroup again in side streets. Later in the day, the government interrupted access to online news sites and Twitter and jammed the cell phone signals in downtown Cairo, which are all measures that show the Egyptian government is perhaps more alarmed than it is admitting, since President Hosni Mubarak’s regime generally allows such outbursts and venting, rather than giving real political concessions. It’ll take much, much more effort and many more protests to even shake the Egyptian regime, simply because the police and military are much more unified and supportive of Mubarak’s regime, and they widely benefit from it as well [snip] said–Tweets that said policemen were saying we’d like to join you but we can’t. I don’t think that is significant of the entire police corps. There are just so much more policemen than there are protesters. Tough, the protesters were outnumbered today; even today, when there were thousands on the streets, still they were outnumbered by black-clad policemen in anti-riot gear. I just believe that the policemen would be too afraid to even think of joining the protest. I don’t think the Muslim Brotherhood had anything to do with it, especially that I spoke to one of their members today, and they said, we are not formally endorsing this protest, but however, we allowed our young members to join if they felt like it, we allowed them to join in their own cities, but we’re not officially behind these protests, despite what the interior minister said. He was trying to pin it on the Muslim Brotherhood. However, I don’t believe this is true. The Muslim Brotherhood was not behind this protest. NADAR: As night fell, thousands of demonstrators attempted to an all-night sit-in in Tahrir Square. Despite relative calm throughout the day, security forces violently dispersed those who remained. This is Danya Nadar reporting for The Real News Network.